As I touched down in Colombia, the waves of heart-pounding excitement came upon me. I was looking forward to the wedding that brought me to this foreign land, yes, but it was more the prospect of another opportunity for culinary exploration that had me on the edge of my cattle-class seat. 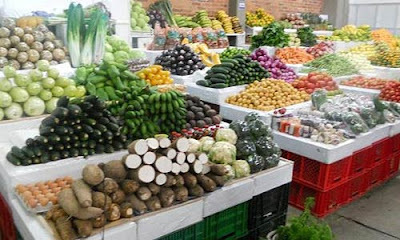 The fresh food market I visited in Bogota will make any foodie feel like a kid in a candy store. The array of different fruits, vegetables and spices are mind-blowing and it’s easy to lose yourself in a world where senses are heightened on every level. A fruit I came to love within my brief yet busy visit to Colombia was guanabana. This fruit is like a creamy combination of various tropical fruit flavors, all packed into one rather precariously spiky looking green shell. This fruit would be the perfect complement to the vanilla ice cream we are going to make in Level 2 of the Classic Culinary Arts program. There are many fabulous fruits native to, or available in Colombia. 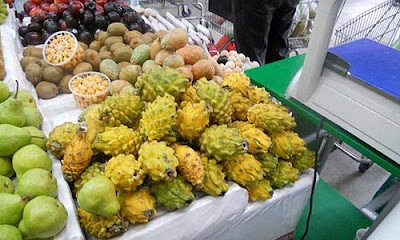 These include lulo, feijoas (a childhood favorite of mine), and pitahaya. Something that they love to do with all of these fruits is transform them into deliciously decadent fruit smoothies… and I tried my fair share of them. Just across the lot from the fruit and vegetable market was a small ocean market. The first thing I noticed was how much they love to preserve food using the vacuum sealing method, something I also saw a lot of at the local supermarket. Our class learned about food preservation in Level 1. Vacuum sealing involves drawing out oxygen in the package so that food stays fresh, without altering the texture or flavor like other methods of preservation might. They are onto something. Then I saw the lobsters and it brought me right back to shellfish lesson. Despite the fact that the recipes in this lesson have become some of my favorites, the method of killing the lobster still disturbs me to this day. Although I had never killed a lobster, I had no qualms about getting to class and throwing this tasty crustacean into a pot of boiling water. Hey, I could have even quite happily stabbed a knife through its googly-eyed head. However, this was not to be. It turns out that a traditional French technique for killing lobsters is to numb them in ice-water for 20 minutes and twist off its tail-end at the abdomen. Since the tail end is essentially all muscle for swimming, the lobster remained quite alive as we were instructed to tear off its squirming legs until it finally died properly when we picked out its brains. I somehow managed to get through, but there were moments when I just wasn’t sure. Okay, to be fair, lobsters don’t have much of a nervous system, but I still felt like a sadist. The lobster did not die in vain—the end result was delicious. Back to the foods of Colombia. 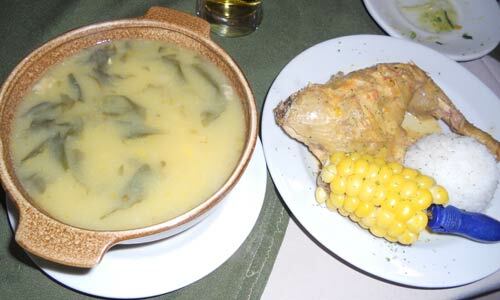 A very traditional soup in Colombia is ajiaco. This is a bound soup (something I learned in soup lesson, as the broth is bound by the starch in the potato). This rich and creamy textured soup is served with cilantro, chicken usually on the bone, rice, capers, avocado, corn, and heavy cream. That’s what I call a hearty meal! There is nothing about any of those ingredients that I don’t love and they work wonderfully together. Surprisingly to me, Persian food is very popular in Colombia. Over the years, many Persian people had migrated to the coast of Colombia and as a result it has become a large part of their cuisine. At a family member's home we were served hummus, fried kebbeh, and grape leaves to name a few. From rice and meat wrapped in grape leaves to fish wrapped in paper. One of my favorite recipes I have made in class is fish en papillote. This dish includes cutting out a heart shaped piece of parchment paper, putting tomato fondue and mushroom duxelles on one side and laying the fresh fish on top. You then top the fish with the a’langlaised julienned vegetables (celery, carrot, and leeks), add a sprig of thyme and a splash of white wine, before sealing the parchment paper together. It then goes in the oven and expands into a glorious encasement of steam, that once punctured releases the full aroma of what’s inside. Are you salivating yet? One of the fish dishes I had in Bogata was Bagre river fish with a corn salsa. Although not traditional, I would like to experiment and try making fish en papillote with the corn salsa in place of the tomato fondue, as I think it would work amazingly as the sweet aspect of the dish. Amongst the other delicious and traditional foods I had much of during my stay in Colombia was coconut rice, beef with a prune-based gravy, the vegetable yucca (yucca pont-neuf anyone? ), and of course lots of plantain. As I headed towards the airport, I finally understood the expression when people say they are in a “food coma”. Through the haze of my food coma, I can describe the way I feel about this trip in one word—inspired. Emma is originally from New Zealand and is a Classic Culinary Arts student at The French Culinary Institute. She is inspired by cuisines of different cultures and loves to cook for anyone willing to eat her food. Chef Robert Bleifer gets "Chopped"